Rupert can tailor any of these topics to last from a few minutes to a full hour. He can also combine any of the subjects to create the talk that most interests you and your group. The Gifts of Autism - why autism is not a problem to fix. How stims become skills. Harnessing the powerful memory. Unleashing the intellect, and the extraordinary absence of ego with it's corresponding positive mental health. How to train the autistic brain - this is not training the intellect: most autists have very powerful intellects. This is how to deactivate the amygdala and how to calm the nervous system so the learning receptors of the brain can engage without anxiety. Movement Method - Basic brain training to open up the brain's learning receptors, creating the learning brain and healing the nervous system. Works for all - kids and adults alike - not just special needs. Horse Boy Learning - Adapting the K-12 curriculum to be learned while moving in nature - in collaboration with several Universities (among others Osnabrueck, Germany and Belmont, TN) with an emphasis on fun, exploration and discovery. 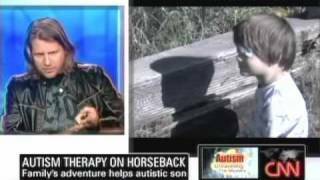 Horse Boy Method - equine therapy designed specifically for the brain and nervous system. Very effective for autism, ADD, ADHD, anxiety, depression, PTSD, chronic pain and fatigue and all other neuro-psychiatric conditions. How to avoid burn out for teachers, therapists and caregivers - includes specific exercises in self-compassion and self care, creating the right working environment and incorporating your dreams into your day to day. Living with tribes - How to do it and how not to do it. Horseback adventures - the best of Europe, Africa, North America, and beyond. How to become a successful author including how to find the right agent, publishers (or successful self-publishing), and understanding royalties. Understanding the spirit world - how ancestors, god, and nature all work as one. Baucher vs Steinbrecht - were they both right? Who was Robichon de la Gueriniere and how does he affect us today?